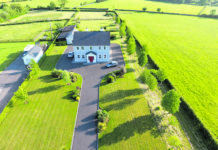 This property is located at Cummer, Claregalway, just off the N17 Galway to Tuam road within close proximity of the city centre and the M6/M17/M18 motorways. Constructed in 2004, the residence at Corbally North is situated at the end of a quiet cul de sac. It was originally built by the current owners who have designed and maintained this home to a very high standard throughout. On the ground floor, the fitted features include solid oak timber floors, high-quality fitted kitchen with granite worktops and solid fuel stove, on the first floor there are solid maple floors. The house has oil fired central heating and has a solid fuel stove in the kitchen with gas fire in the sitting room. The 230 square metres property is bright and spacious throughout and comprises sitting room, large family kitchen/dining room, sun room, utility, hotpress, toilet, four bedrooms (one of which is ensuite) and main bathroom.